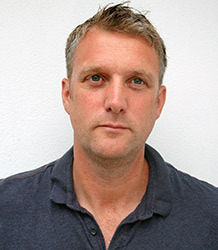 Oliver Creighton is Professor of Archaeology at the University of Exeter. Prof. Creighton's research and publications focus primarily on the archaeology of later medieval Britain and Europe (for a list of key books, book chapters and articles, click the ‘Publications’ tab below). Oliver’s work has a strong interdisciplinary dimension and he has a particular interest in medieval elite culture, buildings and landscapes. He has published widely on medieval castles and their wider social and landscape contexts, as well as other fortifications, including town and city walls. Oliver is also interested in the archaeology and history of designed landscapes, towns and townscapes, and in conflict archaeology and medieval warfare. Oliver has a long-term research interest in the study of medieval castles within their broader landscape and social contexts and in the impact of lordship upon society and landscape. His first book was Castles and Landscapes (2002), now available as a second edition (Castles and Landscapes: Power, Community and Fortification in Medieval England, 2005) in paperback. A more recent publication that explores the wider European context of early castle building is Early European Castles: Aristocracy and Authority, AD800-1200 (2012). Oliver has also published a concise guide to the subject with R.A. Higham, Medieval Castles (2003), as well as numerous other journal articles and papers in edited volumes. He continues to pursue new approaches to the study of castles, with particular emphasis on their social and symbolic roles. A linked research project, funded by a Leverhulme Trust grant, was the first ever archaeological study of the 'Anarchy' of King Stephen’s reign on the landscape. This has produced two books: The Anarchy: Conflict and Landscape in 12th-Century England (2016) and Castles, Siegeworks and Settlements: Surveying the Archaeology of the Twelfth Century (2016), as well as a series of journal articles. Read a blog on these publications here. The phrase ‘designed landscape’ is generally associated with the great parks and gardens of the post-medieval period. But can the concept of landscape design by traced back before the Renaissance? Oliver’s 2009 monograph Designs upon the Land: Elite Landscapes of the Middle Ages explores how elite landscapes of the medieval period were manipulated for reasons of leisure, pleasure and visual impact. The archaeology, heritage and social history of town defences is another central theme within Oliver’s research. Along with Exeter colleague Robert Higham, Oliver published the first volume of research on the subject for over thirty years, Medieval Town Defences: A Social History and Archaeology (2005). Oliver was also a co-director of a major AHRC-funded research project that investigated the historic townscape of Wallingford in Oxfordshire. Working with the Universities of Leicester and Oxford, the project culminated in the 2013 volume published in the Society for Medieval Archaeology Monographs Series Transforming Townscapes. From Burh to Borough: The archaeology of Wallingford, AD 800–1400. Oliver is interested in the origins and functions of open space within medieval towns and led the first ever geophysical survey of Exeter's Cathedral Green. Oliver also researches in the field of archaeological heritage management, with a particular interest in buildings and landscapes. He co-directed the AHRC-funded project Community and Landscape: Transforming Access to the Heritage of the Poltimore Estate. Running from 2010–12, this knowledge exchange project promoted public involvement with the rich and multi-layered heritage of a country estate in the Exeter region. Learn more about the Poltimore House Trust by following this link. Professor Creighton supervises postgraduate research students working in the following areas: castle studies; medieval archaeology; landscape archaeology; medieval towns; buildings archaeology; conflict archaeology; and designed landscapes. 2011–present: Jacqueline Venininger, PhD, Conflict Landscapes on the Anglo-Welsh Marches. 2012–present: Richard Nevell, PhD, The Slighting of Medieval Castles. 2010–12: Margaret Wilby (part-time), MPhil, Control, Co-Operation and Conflict: An Interdisciplinary Study of Later Medieval Urban Water Management in Britain, AD 1066–1540. 2011–12: Katherine Hollinghurst, MRes, Anglo-Norman Monastic Landscapes in Wales. 2008–11: Michael Fradley, PhD, The New in the Old: Urban Castles in Britain. 2008–11: Imogen Wood, PhD, Changing the Fabric of Society: Ceramics in Early Medieval Cornwall. 2007–11: Martin Goffriller, PhD, The Castles of Mallorca: Territorial Control on an Islamic Island. 2008–10: Samuel Walls, PhD, The Materiality of Remembrance: 20th-Century War Memorials in Devon. 2006–10: Simon Foote, PhD, Early Medieval Urbanism in South-West England. 2002–06: Adam Wainwright, PhD, Created Landscapes: Using the Past in Post-Medieval Designed Landscapes. In terms of fieldwork, Oliver has a particular interest in archaeological survey, including earthwork survey and geophysics, and has worked extensively in the UK as well as in Italy, Spain, Jordan and Libya. In the spring of 2017, Professor Oliver Creighton and a team from the Department of Archaeology will be carrying out the first ever geophysical survey of Exeter’s Cathedral Close to map its ‘lost’ archaeology. Working in partnership with the Cathedral authorities, the survey aims to produce new information on the area’s development between the Roman and post-medieval periods while building practical skills for students that can boost employability and be transferred into the workplace. The work will have a high public profile and a positive social, cultural and educational impact by promoting understanding of archaeological fieldwork and what it can tell us about historic Exeter. The research root of the work is the lead academic Professor Creighton’s interest in the origins, topographies, development and changing status of open spaces within medieval towns, as demonstrated by his published work on the AHRC-funded Wallingford Burh to Borough Research Project.